Almost a year after announcing their eight-core MT6795 Helio X10 SoC (finally released in March of this year), MediaTek are coming out with the Helio X20. The new chip will add two CPU cores, a low-power "companion" core, updated graphics, and an updated modem, among other things. So excited about the Helio X20 are MediaTek, that they've got a flashy page hyping up its features. Split between three “clusters”, the chip contains two ARM Cortex A72 and eight A53 cores, with the former at 2.5Ghz and half of the latter at 2.0Ghz. 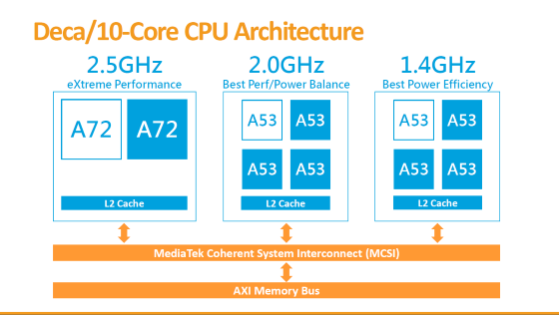 The rest run at 1.4Ghz, and MediaTek's Coherent System Interconnect dynamically enables each cluster of cores only when needed to save power. This means tasks like light browsing and texting will mostly use the lower-power A53 cores, because those cores will provide enough performance for those tasks. But, run something heavier like a game or a benchmark, and the A72s - or even all ten cores a once - will light up for the cause. Interestingly, the Helio X20 includes an eleventh CPU core of sorts, in the form of the Cortex M4. However, at 0.36Ghz, MediaTek are only intending it to play your MP3s while your screen is off to save battery life, besides voice recognition, voice enhancement, and sensor polling tasks. 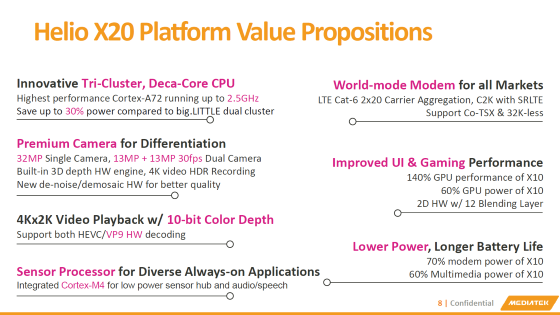 Meanwhile, the Helio X20 will include ARM's new Mali T800 series graphics, which MediaTek claims will be 140% faster than the X10's PowerVR G6200. The X20 will also play 4K HEVC/VP9 video using hardware decoding, and supports cameras of up to 32MP for 4K HDR recording at 30fps. On the connectivity front, MediaTek integrates 802.11ac WiFi, Bluetooth, GPS, and a CDMA2000-compliant LTE modem. The latter enables compatibility with North American wireless carriers, so maybe we'll see some devices running on Helio X20s show up stateside. You'll be waiting a while for those devices, though - until around the first quarter of next year. It'll be interesting to see how big a difference the ten cores will make compared to the competition. Packing extra cores, with compromised clockspeeds, in a SoC usually lets down apps that only use one or two threads, but maybe the high-clocked pair of A72 cores will help mitigate this for the Helio X20.